Pruning out an scale insect infestation. Now is the time to prepare your garden and landscape for winter. The simple tasks recommended below will help prevent perennial weeds, insect pests, and certain disease pathogens so these problems don't get established and become difficult later. Manage weeds using nonchemical methods such as cultivation, handweeding, or mowing. Prevent weeds using competitive plants, mulches, and hand removal. Herbicides (weed killers) are rarely needed in established landscape plantings when nonchemical controls are used regularly. Although most fruit trees are pruned during the dormant season, in areas with wet winters, apricots and cherries should be pruned in late summer to allow time for the pruning wounds to close. 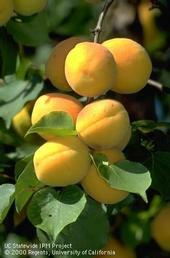 Pruning apricots and cherries during the rainy season could lead to detrimental canker diseases. Cherries, apricots, and a few related species are particularly susceptible to fungal and bacterial canker diseases, including Eutypa dieback, Botryosphaeria canker, and bacterial canker. Pathogens can be spread by rain or tree wounds – such as pruning wounds – during wet weather; subsequent infections spread through the wood for several years and may eventually kill the tree.